I posted this back in the fall, but it is so life-changing, I thought I needed to post again in case you hadn't seen it! Maybe you already use the "foil method" of removal. 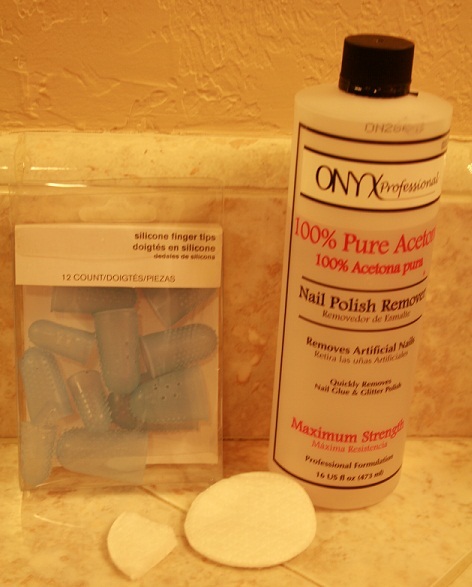 Us hard-core nailies have been soaking cotton balls in acetone and placing them over our nails, covering them with strips of foil to hold them in place and allowing them to do their work. We love that after 10 minutes or so, all we have to do is swipe the cotton ball over our nail to easily remove the most glittery polish. But..... here's something better- the "Reesa Method". Lovely ReesaRN23 from a nail polish community I frequent came up with this and has been sharing her tips with everyone. Her method is much less messy and I'm loving it! Love this! Thanks for sharing such great tips ... I adore my glitter polishes, but definitely shy away to avoid the removal hassle.